The Unsworth “Timbucktwo“ label is used at the winery when made here on the island; the fruit is sourced from other BC wine regions. Peach, honeysuckle and Meyer lemon notes. The palate is packed with juicy orchard fruit and crisp bubbles. This delightful, easy drinking blend is fermented in stainless steel. The fruit is sourced from vineyards in Naramata & the Golden Mile Bench. Citrus, apple, tropical fruit & white florals. Juicy, ripe, fruit forward style, well balanced, and mouthwatering. Peking duck pancakes, fruit salad, orange glazed scallops. The Viognier grape gained notoriety in southern France for its aromatic qualities and was often used as a blending partner with Syrah. Notes of nectarine, honeysuckle, pear and powdery spice. The palate is full bodied, finishing dry. Baked Brie with apricots, orange chicken. Desert Hills is a highly awarded winery and one of the first to plant Syrah in the Okanagan. This little blend is a great value buy. Medium bodied with notes of red fruits and spice. A delightful, easy drinking red. Cheese burgers, grilled cheese, pepperoni pizza. This delightful Pinot Noir is currently the only still red wine being produced by Fitz. Aged in oak and only 217 cases produced. A medium-bodied style with black cherry & raspberry fruits, violets and savoury notes. The winery has two tiers in their portfolio.Daydreamer and a premium selection under “Marcus Ansems.” All Daydreamer wines are named after the couples children. The wines are all vegan, using no animal byproducts. Full bodied with notes of chocolate, red fruits and black plum. Well balanced tannin with a lingering dry finish. There’s no better way to start the New Year than with our January selection of BC wines. Beginning with Vancouver Island, Unsworth Vineyard, located in the Cowichan Valley and headed by winemaker Dan Wright, produces small-batch hand-crafted wines in a maritime climate. The wonderful restaurant that accompanies the winery makes it a lunch destination too. Crossing the Salish Sea into the Okanagan Valley we head to Fitzpatrick Vineyard located in Peachland. A once abandoned peach orchard purchased by the Fitzpatrick family in 1994 has evolved into a winery whose major focus is on “Traditional Method” sparkling wine. (Champagne is made in the Traditional Method . 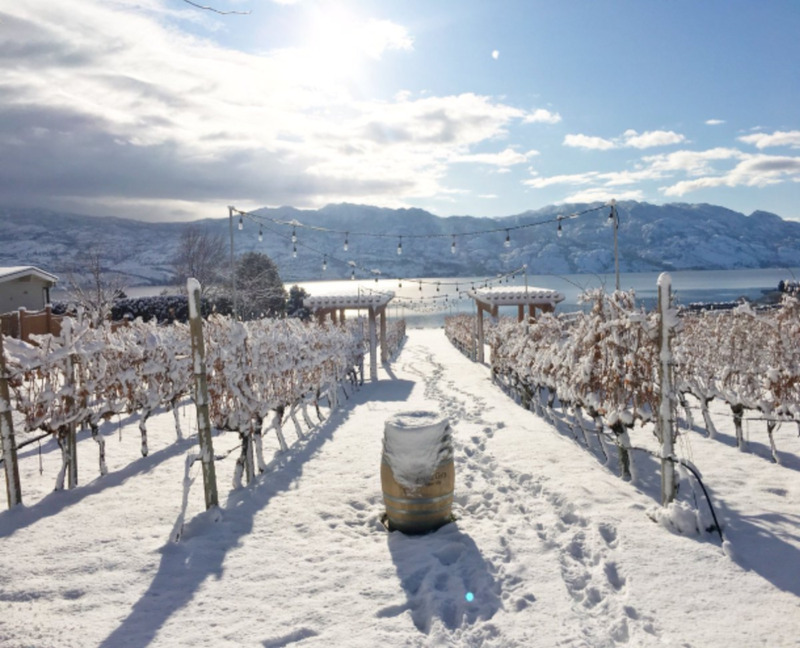 Just south of Peachland in Summerland is Lunessence Vineyard. Sustainable viticulture is at work here as well as audio stimulation. Classical music is played in the estate vineyards all year long as they believe it is harmonious with production; Verdi and Rossini can be heard coming from the cellar door. On the other side of Lake Okanagan, on the Naramata Bench, is Daydreamer Wines. It’s a small family run vineyard where husband and wife team Rachel and Marcus Ansems (winemaker) farm small batch, limited production, sustainable grapes. Heading south, and back on Highway 97 towards Oliver, we find Black Hills Winery. They practice sustainable farming in the vineyard and at harvest. Their west facing vineyards on the Black Sage Bench thrive in the heat of Canada’s only desert. Just down the road and on the right side of the highway is Desert Hills Winery, a family run boutique winery operated by brothers Randy, Jessie and Dave Toor. The brothers turned a thriving orchard business into a thriving vineyard business selling and producing their own wines. Unsworth Winery has a book club called “Worth Reading.” They meet monthly at the Winery Restaurant to drink, eat and discuss. The Cowichan Valley First Nations Band refers to the Cowichan Valley as “The Warm Land”. Daydreamer Vineyard is the 3rd BC winery in a decade to release a sparkling Shiraz. A style quite common to Australia, where winemaker Marcus Ansems hails from.